In addition, the bus stop itself also actually exists, right down to its name of "Honcho-1-chome", the name of the area where Dobuita Street is located. While the bus stop is at the corner in the game (left), it is a short walk down the road in real life (right). 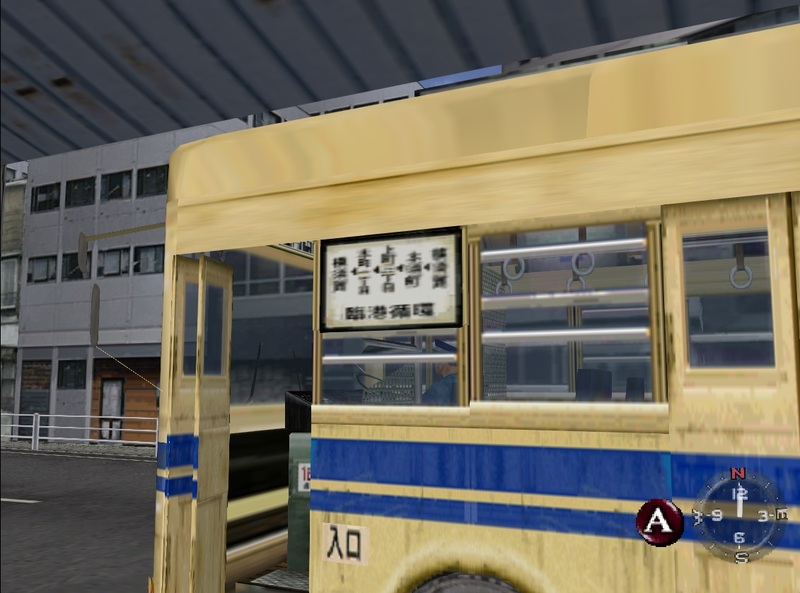 The bus stop sign depicted in the game is a commonly-found style in Japan: a circular sign attached to a pole which is mounted on a concrete block base. On maps, bus stops are often marked with a symbol that resembles one of these sign posts. This style of sign can be seen at some of the bus stops near the real Dobuita Street. 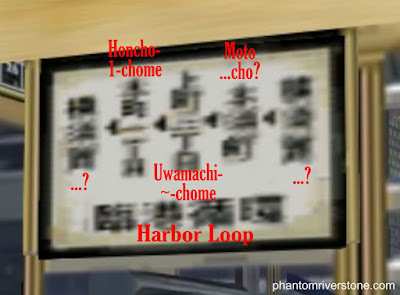 The Honcho-1-chome bus-stop and timetable board as they exist today. 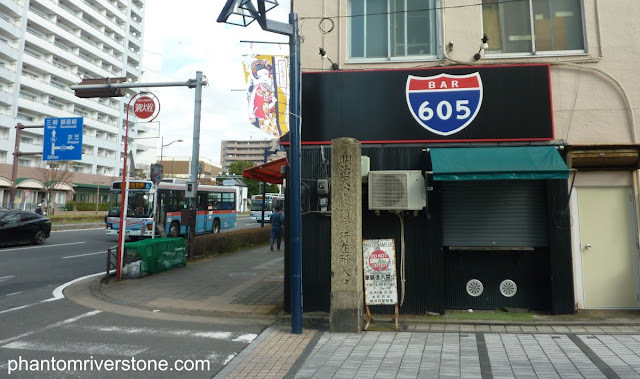 Unlike the harbor in the game, Amihama at New Yokosuka Harbor, the real-life US base at Yokosuka Harbor is located only a few minutes' walk from Dobuita Street and does not require a 20-minute bus ride to reach. However, introducing the need for a bus to reach the harbor was a clever technique for separating out the two areas of the game. The bus stop sign at Dobuita (left) and Amihama (right). Each sign gives the name of the bus stop, as well as the route name ("Yoko-604", a fictional bus route number) and the name of the next stop on the route. At Dobuita, the bus stop's name is "Honcho 1-chome" (as seen previously) with the next stop being "Shioiri Station"; at Amihama the bus stop is called "Amihama minato machi" and the next stop is "Amihama ~chome" (the area number is written indistinctly, perhaps deliberately). In a previous blog post about how to get to Dobuita, we mentioned Shioiri Station, a train station on the Keikyu line that is situated directly next to the Dobuita area. It is a handy place to start a tour of Dobuita Street or going to view the harbor. The map below shows the relationship between some of the above locations in real life. 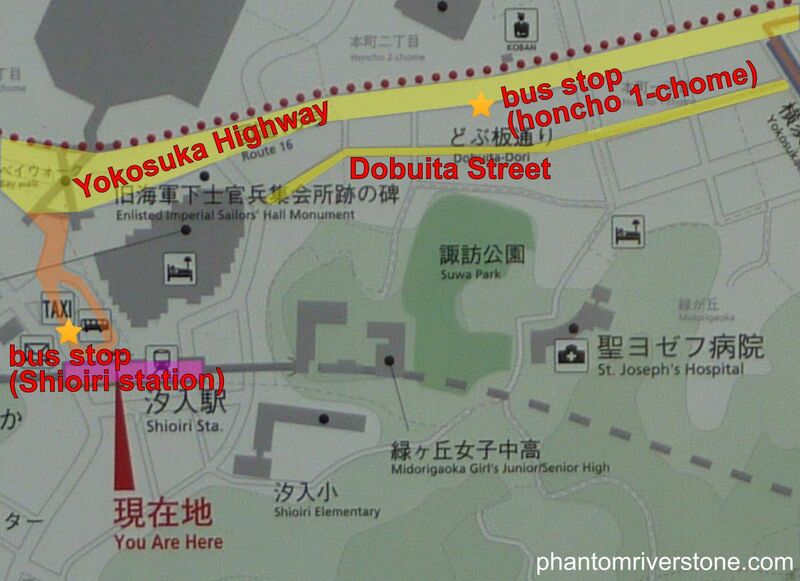 The relative locations of Dobuita Street, the Honcho 1-chome bus stop on the main road, and Shioiri station. Lastly, at the bottom of the bus stop sign are the words "Coastal loop" - being a loop route makes sense of what is seen in the game, where Ryo always catches and gets off the bus on the same side of the road. The route number and name that have been created for the game are also displayed at the front and back of the bus itself. The route name displayed is "Harbor loop", and it's interesting to note that this is slightly different from the wording "Coastal loop" on the bus stop sign. Route information is shown at the back (and front) of the bus. The bus also has a signboard in the window by the door on the left side indicating the sequence of main areas the bus passes through. (Of course, nowadays such signboards are usually electronic). Unfortunately the resolution of the texture in the game is quite low, making the text hard to decipher. At the side of the bus is a board showing which areas the route passes through. Below is an image of the board at higher zoom. I wasn't able to make out all the names, but the area where Ryo's bus stop near Dobuita is situated, Honcho-1-chome, can be identified. The area prior to this on the route is labelled as Uwamachi, which is also a real area to the south of Dobuita Street. Elderly passengers might have trouble trying to read such a blurry notice. If anyone can help with figuring out the names on this board, any comments would be most welcome. 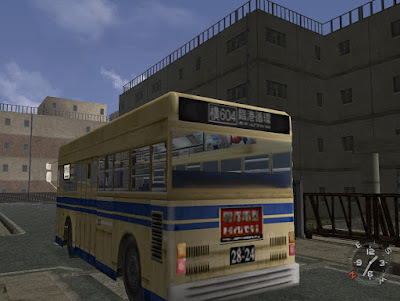 Although the bus route in the game exists only in the game, it certainly should be possible to experience retracing part of the route that Ryo would have taken on his way back by bus from the harbor, by catching a bus from further along the Yokosuka Highway (such as from Yokosuka-chuo station) and alighting at the Honcho-1-chome bus stop from where it is a short walk around the corner to Dobuita Street. If a future post with more details would be of interest to anyone (perhaps to give it a try when they are in Yokosuka), let me know! Thanks SeDGe! What kind of topics would you like to see in future posts? I agree! It's something that got me hooked on the series. And Shenmue HD ;). 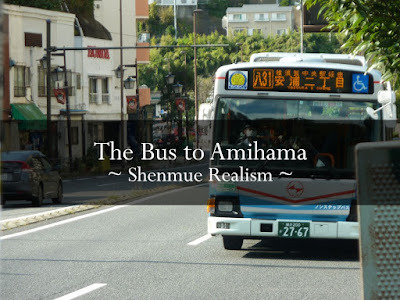 Phantom River Stone, Bluemue’s blog, the Dojo, and the Shenmue Lounge help alleviate the wait. It has been years since I played Shenmue. My current PC setup can’t even run the emulators at full speed. Let's keep up our prayers for Shenmue HD! (Are you planning a pre-Shenmue III PC upgrade? :D Although I don't imagine the game should be particularly demanding compared to emulation). Yes, I should have a more cutting edge computer by the time Shenmue III is released. Although I did purchase a PS4 mainly for that reason, but it seems PC gaming, for the most part, seems to win in the graphics and performance department. I have to admit there is something about putting a disc into a console to run a game that I enjoy rather than just digital-play which is quite popular in this age. Also nothing beats having a physical version for displaying on the shelf. :) It will indeed be interesting to see how the PS4 and PC versions compare. The trial/demo version reward may also give some indication of how the full game will run, although obviously that's only for the PC.